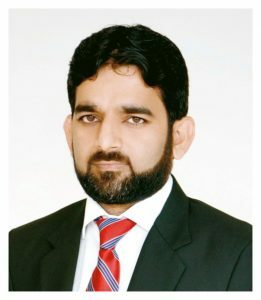 Mr. Sagheer Mushtaq is a member of Institute of Cost & Management Accountants of Pakistan. He joined the Company as Chief Operating Officer during January 2017. Subsequently, he was also assigned the role of Chief Financial Officer of the Company. His main areas of job as COO/CFO includes the preparatory works for launch of REIT scheme, formation of business strategy, evaluation and appraisal of new projects, financial management/ modeling, budgeting and forecasts etc. He has over fifteen years of diversified experience in the field of finance, operation and regulatory compliance. He started his career with Islamabad Stock Exchange (ISE) in the finance department during the year 2007 and worked in different positions including Risk Manager, Chief Financial Officer and Chief Regulatory Officer. While associated with ISE, he leads various assignments including demutualization of exchange from guarantee limited to company limited by shares, setting up of regulatory affairs department and was instrumental in developing the internal control policies and systems and effective compliance function. Earlier to joining the Company, has was associated with Pakistan Stock Exchange as Regional Head of Islamabad and Lahore region.